Most of us have heard of tuberculosis, but few are familiar with Sphingomonas, a relatively obscure genus of environmental bacteria. 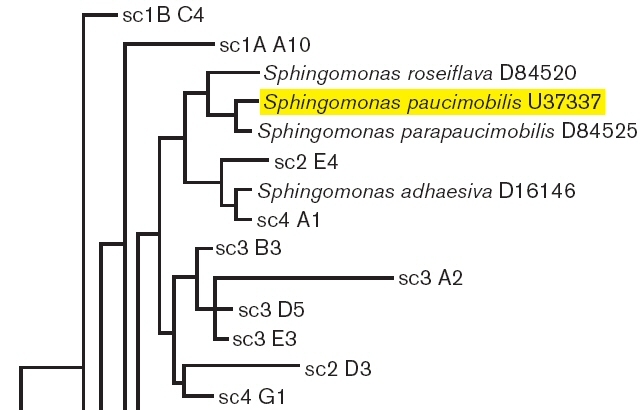 Sphingomonas is just one of a number of microbial hangers-on to turn up in a metagenomic analysis of a shower curtain. The senior author Norm Pace is better known for isolating extreme thermophiles at Yellowstone, their DNA sequence so foreign they might almost come from another planet. But occasionally he turns his attention to extreme environments closer to home, such as the water and air of a hospital therapy pool, or even your own home shower curtain. DNA analysis reveals many species, and measures how related they are. Some of them, such as Sphingomonas paucimobilis, turn out to be potential pathogens, especially in people with weakened immune systems. BTW when I first heard this, I finally cleaned all the pink scum off our shower curtain (for the first time in years). My husband’s allergy symptoms immediately cleared up. Which rarely-thought of parts of a home would you like to see tested? My class tests such environments regularly, and we’re always open to ideas. Are you checking the ecosystem of your own lab on a regular basis? If not, I’d say that would be a great location. If nothing else, it will tell you what could mess up any experiment you run. Another simple experiment you could run is making kim-chi made from scratch. The thing about kimchi is that the product has a life-cycle. When you get it early, it’s not quite “ready” (and the jar is still fizzing merrily. This is how they sell it in Korean markets). Then it matures, with peak flavor for about a week. Then it starts getting really sour, and goes best in soups. Since kimchi often relies on endogenous bacteria to work, you could have a lot of fun tracking bacterial ecosystem succession over the course of kimchi development, with replicated experiments even. You could also link those to particular flavors and/or chemical properties. How about the bottom of a pet dish that is refilled with water without being wiped out or washed for a week or more? Those all sound like great ideas! Yes, we get great stuff out of corners of the lab. And the pet water dish is sure to contain something. Still in a typical domestic bath/shower room, how about testing inside the medicine cabinet, since that’s where most people keep their over the counter “cold cures” and analgesia? Medicine cabinet–a good place to find viruses, that’s for sure. All those cold remedies that don’t work. Dishwashing cloths, spunges, brushes, or whatever it is you use in and around the kitchen sink. If the kitchen sink itself is grimy, just study that grime, I suppose, but even if the sink is spotless I expect the cleaning implements to be interesting. The office electric water kettle: people are constantly opening and closing it with unwashed hands/fingers; it’s seldom cleaned/washed thoroughly; the water boiling point temp is not sustained very long so might be a good breeding ground for temp-resistant bugs. Yes, I have an absolute horror of sponges. And washcloths and towels. Gym towels used to just carry ringworm, but now MRSA. “Water kettle” Actually, I wonder if the water kettle collects thermophiles. I’ve heard you can isolate interesting environmental thermophiles from the hot water tap. I always wonder about doormats. (and THANKYOU for “The Highest Frontier” – It was so good I feel guilty about getting it from the library – I’ll gift a few for sure).